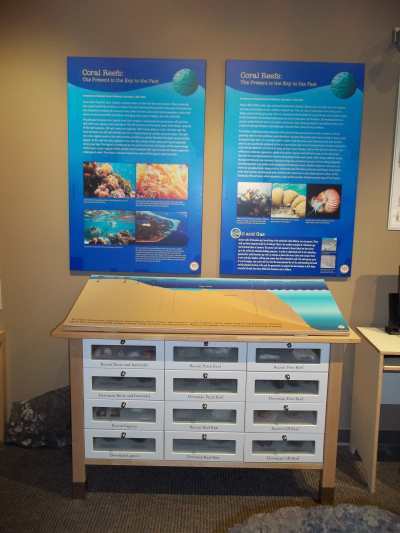 ￼In May of 2014 the Quartermain Earth Science Centre and Department of Earth Sciences at UNB approved the addition of a new exhibit inside the Quartermain museum. 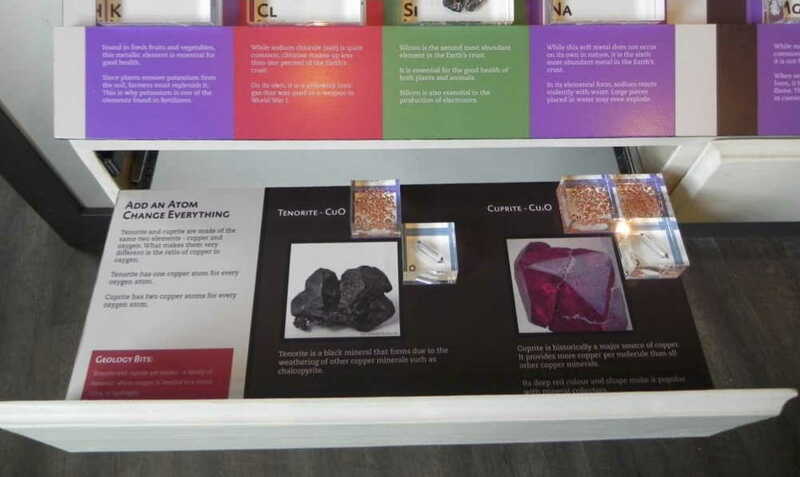 The World of Minerals Exhibit includes two interactive series of displays exploring 1) mineral properties and 2) optical mineralogy. The first part of the exhibit (mineral properties) was opened to the public in September 2015. 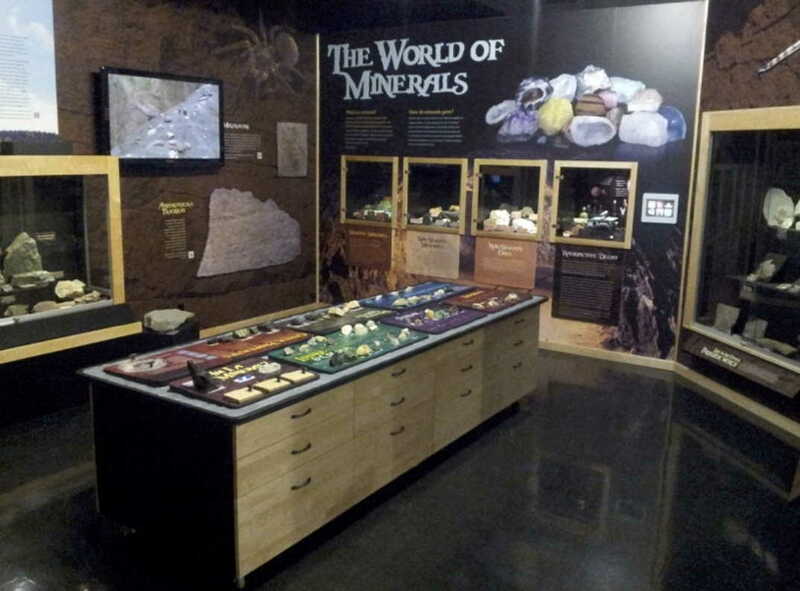 Located just inside the Quartermain Museum, visitors see a stunning mural behind a series of interactive displays embedded on a custom designed cabinet with a colourful textured surface and several interactive displays showing each mineral property. Inside the cabinet are numerous drawers with hands-on mobile games that compliment the tabletop displays. 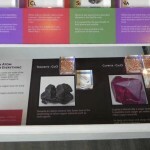 Side display cases show beautiful specimens from the silicate, non-silicate, non-silicate ore and radioactive groups of minerals. The Quartermain Museum celebrated the completion of the first half of the World of Minerals exhibits by September 10th with a “ribbon-cutting” soft launch on September 18th, 2015. After a short welcome and opening speech greatly thanking CGF and those involved with the design and building of the displays, students, faculty and staff enjoyed interacting with the new addition to the museum. Comments such as “very interactive”, “a fantastic fresh new addition to the museum”, and “this will help me learn – can’t wait to see more!” were well received. ￼￼Since the launch just under 600 students (~60 educators) and over 500 visitors have interacted with the new display. 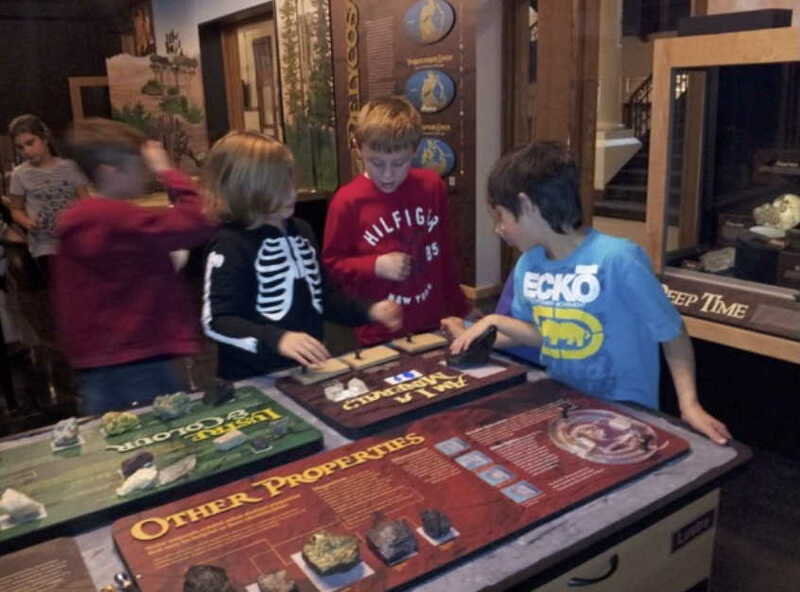 In general younger students are attracted to the “Am I a Mineral”, “Other Properties” and “Specific Gravity” tabletop displays as well as the mineral games available on the tablet. Older students and adults spend more time with the information on mineral properties and groups, and enjoy the variety of unique specimens. Mostly visiting families and undergraduate students have independently played the mineral games available in the cabinet drawers. The displays and games have also purposefully been used to compliment undergraduate studies within the department. Most pleasing was to witness on several occasions undergraduate science, forestry and geoengineering students bring non-Earth Science/engineering friends and relatives to the museum, providing educated tours of the minerals displays. 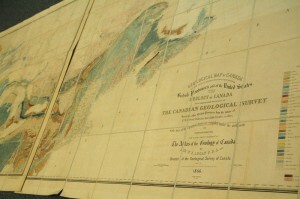 The first Geological Map of Canada produced by the founder of the Geological Survey of Canada, William Logan, in 1866. The Logan Legacy Fund was established in 1992 to coincide with the 150th anniversary of the Geological Survey of Canada. 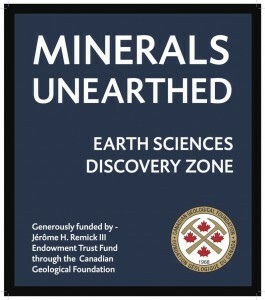 It is a registered charity administered by the Canadian Geological Foundation and is a unique initiative whereby a government agency solicits private funding for preservation of rare library materials. The first five years of fundraising were highly successful but subsequent years saw a gradual decline in donations. Annual disbursements were lower than we anticipated and work proceeded at a slow but steady pace since there are few skilled professionals in the area to carry out complex conservation work. We ceased active fund raising in 2000 having raised approximately $100,000 over the years. Between 1993-1995 the personal library collection of Sir William Logan was conserved. Work depended on condition of the volume. Some were completely rebound and cleaned while other items needed only minor repairs. All of the 100+ volumes were de-acidified by Library and Archives Canada. Each item was assessed in terms of scientific merit and historical significance and the collection was appraised at a value of $100,000. A paper conservator provided conservation and proper archival storage for three separate manuscripts associated with Logan and the early Geological Survey organization. An assessment of the Exploration Collection was undertaken in 1997. This collection consists largely of 17th and 18th century works pertaining to exploration of North American continent, containing natural history, botany and geology. 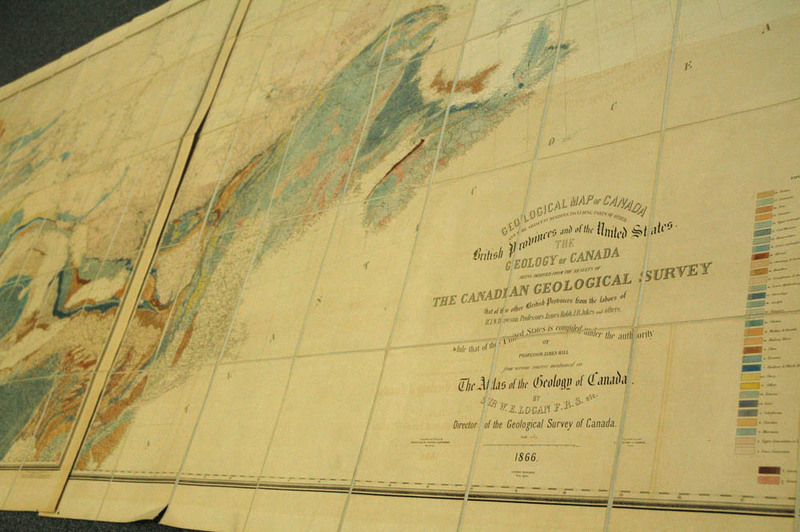 Some of the earliest observations of the geology of Canada may be found in these volumes. Complex conservation treatment was applied as needed to works of special significance over subsequent years. A collection of approximately 500 original paleontological drawings created by A. Lambe in the late nineteenth century have been individually cleaned and conserved, mounted on acid-free card and placed in archival boxes. These drawings were used to create plates in early GSC publications. Funds were also provided to enable GSC Calgary to restore some of their rare collection of nineteenth century material pertaining to the Canadian Arctic. An important part of Canada’s geoscience heritage is now conserved for future generations; on occasion, items from this collection have been loaned to the museums in support of special research and exhibits. Access to the material is available through the NRCan Library Catalogue which holds metadata for this collection. 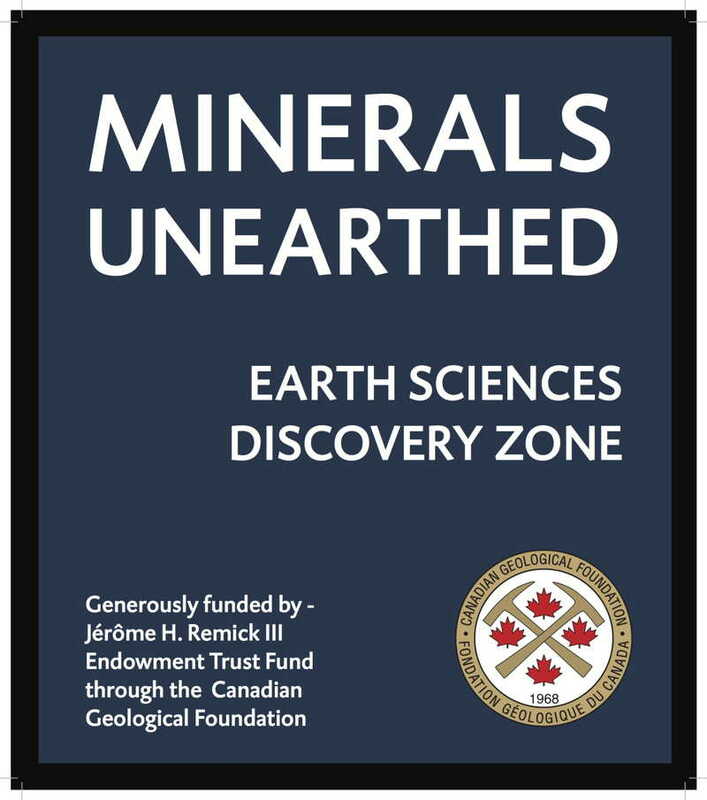 A grant from the Canadian Geological Foundation is supporting “Wunderground” at the Johnson GeoCentre, St. John’s, Newfoundland. “Wunderground” follows the adventures of Mr. MasterMinder, an energetic and eccentric scientist who combines science knowledge with circus performance to teach kids about the world beneath their feet. In Wunderground, Mr. MasterMinder searches the underground layers of the Province for ways to power his newest invention – The Amazing Robotic Portable Power Pack! Collecting samples in his 9ft robotic suit, juggling “molten” rocks, and spinning Tectonic Plates are just a few of the antics that that the energetic scientist uses to enthrall the audience as he teaches them about Earth energy. “Wunderground” has been developed by the Johnson GEO CENTRE and Beni Malone, in partnership with Nalcor Energy and the Canadian Geological Foundation. The show will be available to the public in November 2010, and will run on Saturday and Sunday afternoons at the Johnson GEO CENTRE on Signal Hill. “Wunderground” will also be available from Monday to Friday for teachers and students who would like to see the show as part of their GEO CENTRE visit. “Can you remember the first time you went to the beach? You probably had fun splashing in the waves and the water. 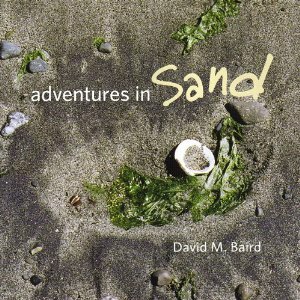 Then you laughed with pleasure to feel wet sand under your bare feet! You looked back to see the tracks your feet had made as you walked. Soon you discovered how to build forts and castles. Before you left, you may have watched as the waves wore everything away to flatten the beach again. 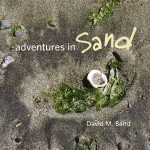 Did you wonder where all that sand came from, and did you know that every grain has a story to tell? The book is available via Amazon.ca and other outlets.